Natrelle 421 cc silicone gel implants placed in a sub muscular plane via a periareolar incision. This breast augment was performed by Kurtis W. Martin, MD at University Pointe Surgical Hospital in West Chester, Ohio. Mentor 450 cc moderate profile plus silicone gel implants with a full mastopexy. This breast augment/mastopexy was performed by Cincinnati Plastic Surgery at University Pointe Surgical Hospital in West Chester, Ohio. Silicone breast augment in an African-American patient. Note how well the periareolar incisions have healed and are nearly invisible. Natrelle 457 cc silicone gel implants placed in a dual plane via a periareolar incision. This patient had breast enlargement using Mentor smooth wall moderate profile plus 375 cc silicone gel implants placed under the muscle via a periareolar incision. Natrelle 457 cc silicone gel implants under the muscle via a peri areola incision. These implants will remain high because of the tight inframammary fold. This patient with slight ptosis (laxity) of the breasts wished to have a breast enlargement. She choose Mentor 325 cc silicone gel implants placed under the muscle through an areolar incision. Notice the implants will not correct sagging of the breasts. Breast augmentation using 400 cc Mentor moderate profile plus silicone gel implants placed behind the muscle via a periareolar incision. 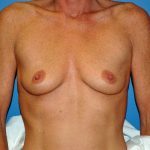 This patient has a potentially difficult breast enlargement due to the constricted lower poles of her breasts. In this type of patient one can not predict how much the skin will stretch and frequently the implants are high riding. Her post operative result shows adequate stretching of the lower breast skin. This patient with ptosis desired a breast enlargement and declined a breast lift.. She underwent placement of Natrelle 575 cc silicone gel implants placed under the muscle. The breasts remain ptotic despite the placement of large implants.